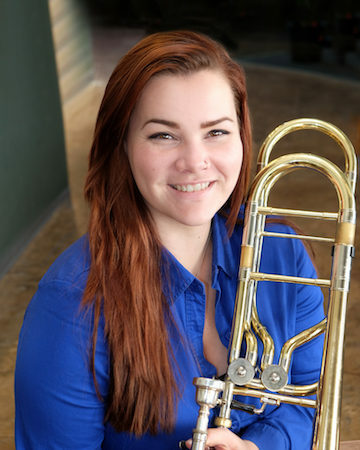 Rose Doylemason is a bass trombonist currently earning her Master’s degree in Performance from UCLA, where she studies with James Miller. Rose began taking music lessons at a young age; she started with piano and eventually fell in love with the trombone. A lover of all things musical, Rose has performed in many types of ensembles, including jazz bands, marching bands, Latin groups, and orchestras. She began teaching trombone lessons to younger students at the age of 15 and has been joyfully teaching ever since. Rose earned her undergraduate degree from Cal Poly, San Luis Obispo, and performed professionally with the San Luis Obispo Symphony while still a student. In her free time, Rose likes to hike, explore Los Angeles, and play with her beloved pet, Cat King Cole.